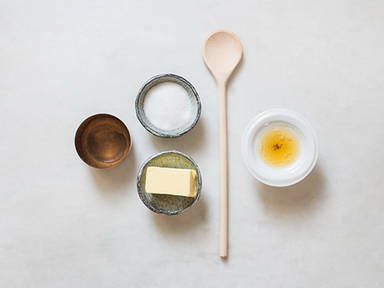 Brown butter sounds incredibly fancy and like an intimidating task for many of us, but rest assured that the French classic is prepared in no time with our tried and tested instructions. You’ll only need the obvious stick of butter, a frying pan, and maybe a utensil to stir. Melt the butter at medium-low heat and be careful not to burn it—more is definitely not better in this case! Watch the pan attentively and remove it from the heat when the butter reaches your desired shade of brown. Thanks to its toasted and nutty flavor profile, brown butter is a fantastic addition to savory dishes: Try drizzling it over your favorite steak, green beans, or pasta dish. It also adds richness and depth to sweet treats.